Ok, so I really don’t know why this never occurred to me sooner. Hot Greenmarket Saturday in Brooklyn…don’t want to cook…don’t even want to grill…get some fresh fish and make ceviche! Even as I just typed that it seems so obvious. Last Saturday it was hot. Like really freaking hot. As I made my way into the Greenmarket for my weekly shop, I found myself looking longingly at the Blue Moon stand, but thinking, “what would I get that wouldn’t involve me firing up the stove or grill?” I wasn’t in the mood for smoked fish, I only wanted to eat things that would be refreshing, and ideally cold. And that’s when the aha! (or, duh!) moment occurred. I chatted up one of the fishmongers, who it turns out had just delved into some ceviche experiments of her own the week before. She said she made hers with flounder and it was yummy, but this week she was going to try squid. I chose some Scrod*, which was the firmest and most appropriate seeming of the white fish that was left (yes, I slept in and missed all the good stuff) that day. She tipped me off to her success in mixing lime and orange juice for the citrus, and we agreed to compare notes and recipes next week. *Wikipedia tells me Scrod is typically young cod, although it is also a common New England acronym for “Seamans Catch Received on Deck”, referring to whatever type of white fish caught that day would be split and boned for cooking. At home I did some good old googling (does Google make money when I type that? That word really ought to have a ‘TM’). I narrowed my search to several Peruvian ceviche recipes, as they typically called for white fish and were closest to what I had in mind. I opted to follow a recipe that called for less time macerating the fish in lime juice, because we’re talking about really fresh fish here, people. I mean, you wouldn’t be making it otherwise. Recipes that called for the fish to marinate for an hour or two just seem paranoid, and I feared would cause the proteins to break down too much and ruin the texture of the fish. Sure enough, it worked like a charm. After the salt water soak, 15-20 minutes was plenty of time in the lime juice to “cook” the fish. Oh, and it was completely and totally delicious. Cut the fish fillets lengthwise into 1/4″ strips. Then cut into pieces about 1.5″ long. Place the fish in a bowl of lightly salted water and allow to rest and tenderize for about 1 hour (I used about 2 cups water and about a tablespoon of kosher salt – the fish should be completely submerged). Drain the fish well and toss, gently with the lime and orange juices, chili, shallots, and garlic. Refrigerate for 15-20 minutes. Just before serving, stir in the cilantro. 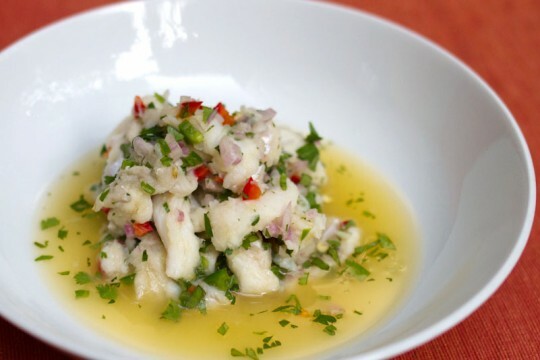 Transfer the ceviche to a serving dish and then spoon some of the citrus juices over top. That’s it! Seriously, so dang easy and tasty. Even on a hundred degree day, I barely broke a sweat! We were lazy and ate the ceviche with chips. I was wanting plantain chips, but Brad returned from the store with corn tortilla chips instead. Next time I think I’ll serve it in lettuce cups with some warm tortillas on the side. Speaking of fish, check out daughterfish.com, a blog about the domestic arts from the daughter of a fisherman. I love ceviche and I love this story. In fact I’m doing a ceviche recipe next month. And did you see this? http://www.seriouseats.com/2011/07/the-food-lab-ceviche-and-the-science-of-marin.html Kinda rad. Good read! Seems my instincts were spot on, as were those Peruvians’ way back when. 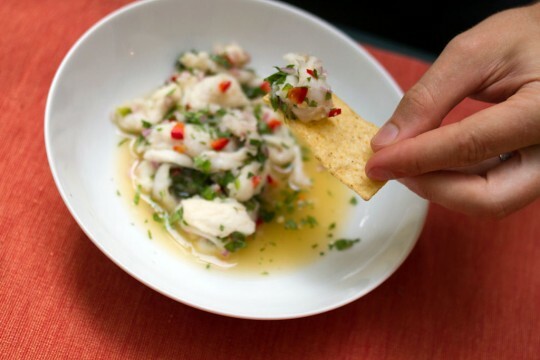 Now I want to do more ceviche experimentation. Looking forward to your recipe!